Alabaster is a kind of rock gypsum (chemically, calcium sulphate) occurring in different parts of the world. 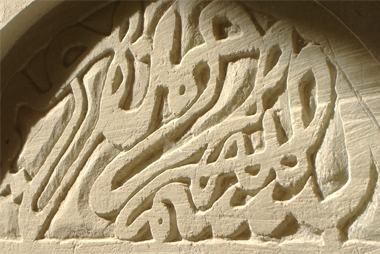 The source of Yemen's alabaster, however, seems to be of unique formation: a horizontal seam suddenly rears up from under sandstone mountains, then branches into narrow plates separated by shale. It is these horizontal plates that the miners tunnel down to, using a technique that can hardly have changed since the pre-Islamic age of Sheba. 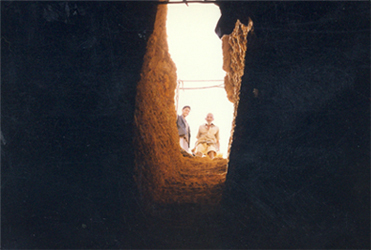 The shafts they excavate can go as far as 30m into the ground, descending at an angle of 45o. Here, in a process that has been compared to ants extracting the icing from between the layers of a very crumbly cake, the miner chips out a slab of alabaster about 90cm by 60cm in size and between 1cm and 5cm thick. He then crawls out of the tunnel, carrying the slab on his back. Given that the slabs can weigh 35kg and more, the work demands strength as well as skill. The sawing operation is an even more skilled process. Once the slabs have been brought to Sana'a (formerly by camels, with two slabs slung each side of the animal's hump), Abdulwahhab will select one and wedge it upright in a slotted tree-trunk. 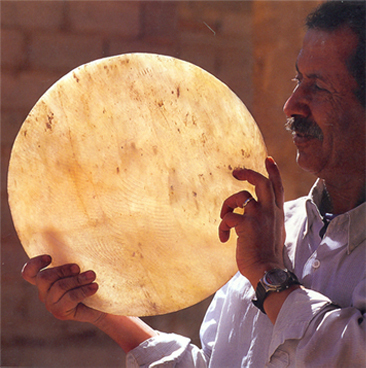 Then, with an assistant, he uses a two-man saw to slice the slab vertically into panes between 0.5cm and 1.5cm thick. Because the slabs are rarely straight, the act of sawing needs an attentive eye and a steady hand to follow the undulations. 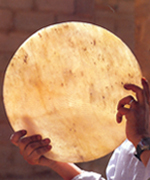 Different grades of alabaster have different grains and different textures, and the clearest-coloured grade, sharifah ('noble'), the colour of clarified butter, is among the hardest to cut. It is highly unlikely that a mechanical means of sawing alabaster will ever be found. The whole operation requires skill, long practice and immense patience. 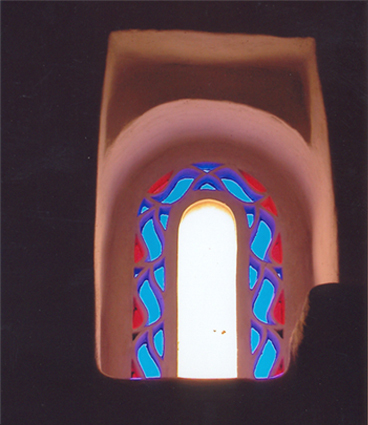 It is when the alabaster panes are installed as windows that their peculiar property becomes apparent. 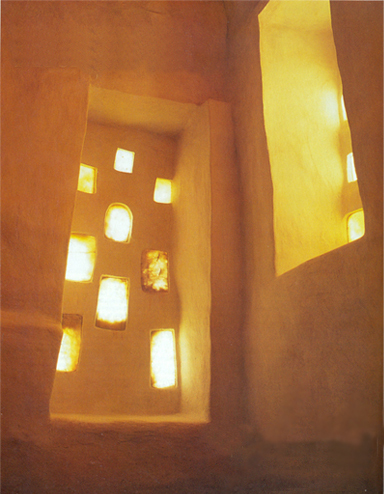 Unlike ordinary glass, alabaster diffuses the full intensity of sunlight evenly around a room but reduces its glare. The effect of its crystalline structure is similar to that of a polarizing lens. The extraordinary nature of alabaster as a lighting material has occasionally been exploited elsewhere - by the builders of a few early Roman churches, for instance, and in a rare modern example by the architects of the Getty Villa in Malibu, California. 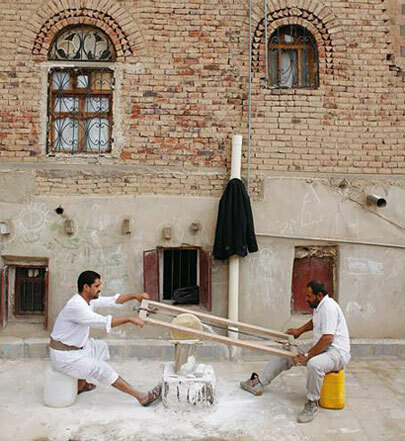 Above all, though, it is the traditional master builders of Yemen who have made use of this magical material and, through the efforts of Abdulwahhab al-Sayrafi, are now beginning to do so once more.